Here is my entry for Emma's Throwback Thursday Challenge on My Creative Time. This week's challenge was to make a shaped card with some orange on it. 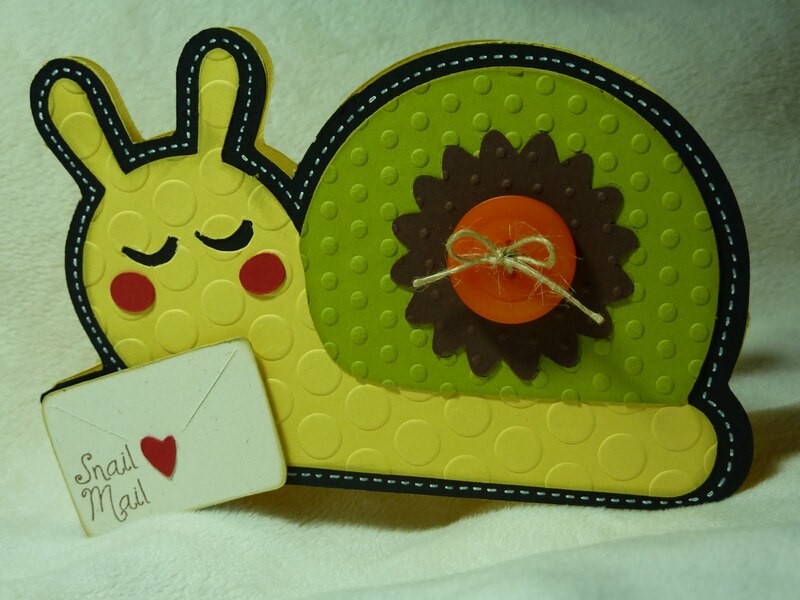 My card was inspired by this cute "Snail Mail" stamp from My Pink Stamper's More Punny-licious Stamp Set. I used my Gypsy to weld together the shadow of the envelope from Doodlecharms, at 1 1/4", to the shadow of the snail from Paisley, cut at 3.13". I copied this, flipped it, and welded it together to make a card. Then I added all of my layers. What a darling card, I love how you used the embossing. This is so cute!! That is one of my favorite cuts on that cartridge. Super cute card - love how you used the embossing. So super cute! I love the embossing! That is sooooooooo cute Katie! Thanks for showing more things to make with my stamps. Love it!! !